SCP-001 photographed from the vantage point at Site 0. 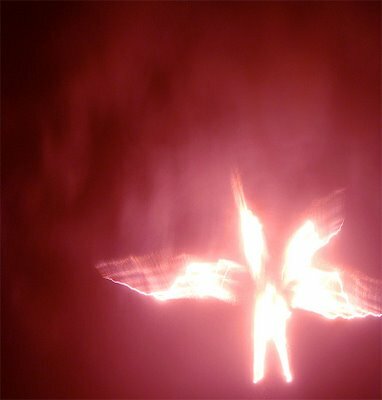 Note the four flaming "wing" appendages located above and to either side of the figure. Special Containment Procedures: Because of the nature of SCP-001, no containment procedures are necessary. 24/7 monitoring of SCP-001 is to take place from a safe (10 km+) distance from a pre-determined location (Site 0). The location of Site 0 is known only to the current SCP Administrator and the single Overseer-level Agent of Abrahamic faith (O5-14) assigned to monitor SCP-001 from Site 0. Said Agent is authorized to take any action necessary should SCP-001 become active, and is required to immediately alert the Administrator and all other Overseer-level agents should SCP-001 show any change in behavior, as this may constitute the beginning of a PATMOS XK-class end-of-the-world scenario. To maintain good relations with one or more organized Abrahamic faiths. To maintain, on hand, a supply of the following: holy water, a rosary, crucifix, cross, prayer rug, or other symbol blessed by an Abrahamic cleric of bishop or equivalent higher rank, a copy of Abrahamic scriptures (Torah, Bible, Quran), and standard emergency supplies in mobile form (bug-out bag). In case of a premillenial rapture scenario, all vital personnel are to designate a secondary operative of non-Abrahamic faith. Said secondary operative is to be informed of the location of the primary designate's copy of Emergency Procedure PATMOS and memetic kill agent innoculant, and is to be kept on ready status to take over the primary's duties as necessary. To maintain familiarity with all other SCPs involved in possible PATMOS XK-class end-of-the-world scenarios. A number of luminous, wing-like appendages emerging from the shoulders, back, temples, ankles, and wrists of the entity. Although an accurate count has never been established, most observers place the number of wings at anywhere from two (2) through one hundred and eight (108), with the mean number being four (4). SCP-001 appears to be standing with its head bowed in a gesture of supplication with SCP-001-2 held in both hands point-down in front of it. Since originally recorded by the Founder over [DATA REDACTED] years ago, SCP-001 has not deviated from this stance. Human beings exposed to SCP-001 report hearing a voice in their heads, giving them a directive which the subject reports cannot be disobeyed. The most common directive is "FORGET", which results in the subject walking away from SCP-001 with no memory of having encountered it. On rare occasions, however, other directives have been given: the most famous of these is the one given to the Founder ("PREPARE"), which he has claimed formed the impetus for founding [DATA REDACTED] to catalog and contain any and all supernatural and/or paranormal artifacts that represent a serious threat to the current existence of humanity. This is the organization now known as the SCP Foundation. Observers have reported that SCP-001 appears to be standing in front of a gate of immense proportions. Long-range photographs have occasionally detected what appears to be a pastoral grove within, containing numerous other entities of the same composition as SCP-001, as well as several fruit trees of unknown composition. Of particular note are two fruit trees of immense proportion near what appears to be the center of the grove: one, it is noted, appears to be an ordinary apple tree, although the other bears a fruit unknown on earth, described as [DATA EXPUNGED]. It is the avowed belief of the Founder that the gate which SCP-001 guards may be the gate to [EXPUNGED] based on correlations with ancient Babylonian texts and the Dead Sea Scrolls. In which case, one can deduce that the entity known as SCP-001 may be [EXPUNGED]. 1. EXPERIMENT A: 1 Class-D personnel instructed to approach SCP-001 as closely as possible on foot. Result: Upon making visual contact with SCP-001, subject is ordered to "LEAVE." Subject immediately turns away from entity and walks away. Despite repeated orders to continue the experiment, Class D Personnel refuses to obey and is terminated. Upon termination of Class-D personnel, all research staff involved are immediately obliterated by an unknown force, presumably SCP-001-2. 2. EXPERIMENT B: 1 remote-operated research robot guided to approach SCP-001 from the ground. Result: Upon approaching within 1 km of SCP-001, research robot is obliterated, presumably by SCP-001-2. All further attempts at remote reconnaissance have the same result. 3. EXPERIMENT C: 100 pre-programmed research drones instructed to approach SCP-001 from multiple angles simultaneously. Result: Coordination is successful, and all 100 drones cross the 1 km mark simultaneously; however, all 100 are simultaneously obliterated by SCP-001-2. Designated observer at Site 0 reports that SCP-001-2 appeared to "strike in all directions at once." SCP-001 did not deviate from its stance while this took place. 4. EXPERIMENT D: Wire-guided missile fired from a distance of 3 km. Result: SCP-001-2 obliterates weapon upon crossing the 1km mark, simultaneously obliterating the launch site and killing all personnel. 5. EXPERIMENT E: Multi-Warhead Intercontinental Ballistic Missile fired from SCP nuclear submarine "Nautilus." 6. EXPERIMENT F: SCP-076 and Task Force Omega 7 instructed to approach SCP-001 on foot. Result: SCP-076 refuses to carry out mission, despite not being informed of the mission's nature. Upon being asked why, SCP-076 replies, "No. Just no." 7. EXPERIMENT G: SCP-073. Due to the results of experiment F, SCP-073 was not informed of his destination until arriving at Site 0. Result: SCP-073 approached the site on foot. Upon seeing SCP-001, SCP-073 became distressed and asked to abort. SCP-073 was ordered to continue. At that point, the symbol on SCP-073's forehead became [DATA EXPUNGED]. Experiment was terminated due to [DATA EXPUNGED]. See Addendum 001-aa. Addendum 001-aa: By executive order of the Administrator, no further experiments are to be carried out re: SCP-001. No further SCPs are to be exposed to SCP-001. SCP-001 is not to be used to dispose of dangerous SCPs. Please see revised containment procedures for details. The following message was received at approximately ████:██:██ this morning from Site 0. SCP-001 has left its location. The Gate is Open. They are riding forth. Upon contacting Site 0, O5-14 responded that no such message had been sent from his location and that SCP-001 remained inert. The transmission was initially determined to be a hoax. However, close examination of the transmission reveals a timestamp dated [DATA REDACTED] years in the future. It is theorized that [DATA EXPUNGED].